Tomorrow would have been Virginia’s 55th Governor Bill Tuck’s birthday, so to commemorate the day I did an interview with University of Mary Washington Professor, and author of the definitive book on Tuck, “Bill Tuck: A Political Life in Harry Byrd's Virginia, by William Crawley Jr.
Virginia Gentleman: Why did you decide to write a book about William Tuck? Professor William Crawley: “The book resulted from the confluence of two factors. The first had to do with the experiences of my childhood in Southside Virginia. Woodrow Wilson once remarked that all southerners were born with an interesting politics, and that seems to have been true in my case. The first politician’s name that I seem to recall hearing was that of Bill Tuck, who was elected Governor shortly after I was born and who served as Congressman during my childhood and adolescence—and, in fact, on through my years in graduate school. As my family was thoroughly supportive of the Byrd organization (as was basically everyone I knew at that time), Tuck was always spoken of with admiration. Plus, the fact that he was essentially a “local boy” from the neighboring county of Halifax (about 35 miles from my home in Pittsylvania County) only added to his stature. Virginia Gentleman: What were some of your best sources for finding information about Tuck? Professor William Crawley: “At the time of my research, there were virtually no secondary sources of any consequence save J. Harvie Wilkinson’s Harry Byrd and the Changing Face of Virginia Politics, which had only recently been published. Consequently, I had to rely almost exclusively on primary sources, the most important of which were newspapers, correspondences, and personal interviews with various figures of the time, most notably Tuck himself. I should also mention that he was extremely generous with his time, never once (as I recall) refusing an interview request. As a result, I met with him many times, mainly at his cottage in rural Halifax County, but also in Washington and other venues. I found him to be surprisingly outspoken—but, then again, that had always been his reputation. The only time he ever seemed guarded was on the one occasion when I taped the interview—this being on an old reel-to-reel machine. All the other times I simply took notes and found him to be much more frank and forthcoming. Virginia Gentleman: Many people know Tuck for his enactment of Virginia’s Right-to-Work Law. Describe how that came about? Virginia Gentleman: Tuck was also famous for Virginia's “Anti-Truman Bill”. What was that? Professor William Crawley: “The genesis of this proposal lay in the hostility of Tuck specifically, and the Byrd organization in general, to the implications of Truman’s proposed civil rights program—the most comprehensive since Reconstruction. Tuck’s startling program, as originally drafted, would have kept the names of presidential candidates off the ballot (using only names of parties and electors) and, even more stunning, would have permitted a state party convention or a committee thereof to decide for whom the state’s electoral votes would be cast—even after the election had been held! 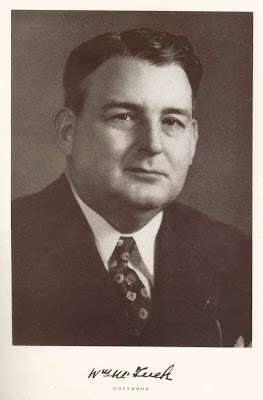 Virginia Gentleman: It seems that Harry Byrd viewed Tuck with some skepticism and that it was only with difficulty that Tuck secured Byrd's support for governor in 1945. What were some reasons for Byrd’s Skepticism? Virginia Gentleman: Most every picture I have seen of Tuck shows him with the big grin and a cigar in hand. My impression of him is as a old time good old boy politician. How would you describe his demeanor? Professor William Crawley: That impression is largely correct, though it tends to obscure the fact that Tuck was by no means devoid of intelligence or unable to behave with decorum as the occasion required. At the same time, he was undeniably a country boy—both by birth and by preference. His culinary preferences tended toward chitlins, collards, and cornbread—often preceded by an ample quantity of “bourbon and branch.” Utterly unaffected by the trappings of high office, he was capable of some decidedly “un-governor-like” escapades, such as firing a pistol in the night air outside the Governor’s Mansion in a playful impromptu test of Capitol security or inviting unsuspecting passersby to have cocktails in the Mansion or to accompany him to the Old Dominion Barn Dance, a popular Richmond hoedown of the period. It was thus with good reason that the adjective most frequently applied to Tuck—and certainly most accurate one—was “colorful.” He was perhaps the closest the Commonwealth ever had to a folk hero in high office. Virginia Gentleman: What were some of Tuck’s accomplishments as Governor? Professor William Crawley: “In conformity with the conservative, small-government philosophy of the Byrd organization, the Tuck administration was far from activist, especially in terms of social programs. Still, there were modest increases in appropriations for education, mental and physical health facilities, welfare, and highways, although Virginia’s support in these areas still ranked near the bottom nationally. Although the Tuck administration could not be called reformist, it did produce some program innovations, however minimal. These included creation of an agency to control water pollution (anticipating by several decades the popular concern for the environment); some salutary changes in the prison system, including outlawing corporal punishment and phasing out the use of chains in road camps; institution of a small tax increase; and a semi-successful effort to streamline the state bureaucracy. There was even a movement toward eliminating the poll tax, though the plan was coupled with other suffrage restrictions that would probably have negated its impact; in any event, the effort, even limited as it was, failed -- and the tax remained in effect in statewide elections until outlawed by Supreme Court decision in 1966. Virginia Gentleman: Former Governor James Battle and Tuck both were eyeing the Senate seat if Byrd chose not to run for reelection in 1958. And my understanding is that Byrd reluctantly ran for re election to avoid the political infighting that would result from a Battle-Tuck primary fight. Is this true? Did he really feel such a fight would destroy the organization? In any case, the likelihood of an intra-organization contest between Tuck and Battle probably did influence his decision to run again, since it would have likely divided the organization in a serious way. It is impossible to know what the outcome would have been between Tuck and Battle, both of whom had their organization adherents. Tuck later ventured that he would probably have been supported by most of the older leaders such as Darden (who was by then president of UVA), while Battle would have drawn the younger ones, more of whom would have worked with him as governor. Tuck later suggested that he believed that Byrd would have eventually supported him, but was by no means certain of it. Virginia Gentleman: What about Tuck’s post-retirement career? "While the dignified Darden was once hailed by a political opponent as 'the noblest Roman of them all,' Tuck was a brash good-timer described by the Richmond News Leader as having 'the comfortable appearance of a man who has just dined on a dozen pork chops.'"